It is thought that the village of Campsea Ashe had its origins in Viking times, between 800-1066AD, when there were two small settlements. The evidence for this comes from the Viking names of these settlements. One was called “Kampi Ey”meaning a camp and an island. The other was named as“Esca”, meaning Ash. An ash tree was often grown to mark a settlement . The Norse people believed that the ash tree was the tree of life and therefore very important. The name of the village(s) has changed many times over the centuries and even today there are two different spellings. After the Norman Conquest, the village was recorded in the Domesday Survey of 1086, where the manor of Campesiawas referred to as a small flourishing settlement of over 200 acres. Esca was recorded as a smaller neighbouring settlement. As in all other manors and lands across England, William granted his noblemen manors and lands who were his tenants-in-chief. According to the Domesday Survey, the manors of Campesia and Esca were held by Count Alan, (Earl of Brittany), Robert Malet, Hervey de Berre and the Bigod family, who were related to William 1st. The Bigod family held a small parcel of land in Ash Manor along with extensive lands in Suffolk and Norfolk. They built a motte and bailey castle at Framilgham, Suffolk. They held these lands until 1310, when Roger Bigod, 5th Earl, died without issue. Thomas (Plantagenet) de Brotherton was granted all these lands around 1310-1312 by his step-brother King Edward 2nd. Thomas’s daughter succeeded him in 1334 and through her marriage to John Segrave, their daughter Elizabeth passed the estates to her husband John de Mowbray. The de Mowbray family held the estate until the mid 1400s, when Margaret, daughter of Sir Thomas Mowbray and Lady Elizabeth Fitzalan, married John Howard. The estate was then in the hands of the Howard family ( Dukes of Norfolk), who held it for most of the time until about 1640. It is believed that the small parcel of land in the Manor of Ashe continued to be part of the estate. In 1195, Theobald de Valoignes, a nobleman of Norman descent, gave his lands in Campsea to his two sisters, Agnes and Joan so that a priory could be built. Theobald held a number of manors and large estates in the area including the Manor of Parham. The Priory was built in 1204 and Joan became the first prioress. Although not the wealthiest priory in East Anglia, it had a number of rich benefactors. In 1348, Maud Countess of Ulster, founded a “chantery” in the grounds of the priory and also gave lands in the village, which she had purchased. Her second marriage to Ralph de Ufford linked her with the area. Several of the de Ufford family were buried in the priory. The priory continued to flourish until 1536, when Henry 8thpassed the Act of Dissolution. Along with all other religious houses and churches in the country, the priory buildings, lands and tithes were seized by the King. Much of this was granted toSir William Willoughby, Kt. of Parham. He sold the Priory and its demesne to John Lane Esq. who lived in the Priory. The Lane family lived there for a number of years until it was sold to Frederick Scott. It was sold again in 1655 to Sir Henry Loudham Kt. Willoughby sold the Manor of Campsea to Anthony Bull of Ipswich, gent. It appears therefore that the Priory lands included this manor or part of it. During the period of 1200 to 1500s, the manors of Campsea and Ashe are part of them, were held by the nobility who would not have lived in the manors. They all owned large estates, some in East Anglia and some further a field. There is reference to the following, who held part of the Manor of Campsea or Ashe or both during this period. John de Thoese or Moese appears to be the first named and through the marriage of his daughter, Margaret it passed to her husband, Thomas de Weyland around 1263. The de Weyland family held the manor(s) until the marriage of Cecily de Weyland to Lord Bartholomew Burghhersh in 1335 and from there, through marriage again of Margaret Burghersh to Edward de Spencer. There is a reference to Hugh and Northland held part of the manor of Campsea around 1433. The Manor of Campsea was purchased by Sir William Willoughby. It is known that Thomas Gresham held this manor in the mid 1500s. 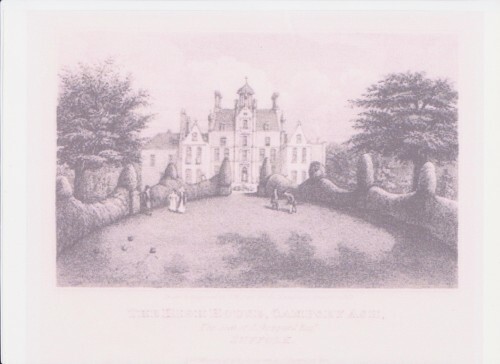 It has also been mentioned that Sir Richard Wentworth, the Stringer and Jenney families were connected with the Manor of Campsea. John Glover Esq. 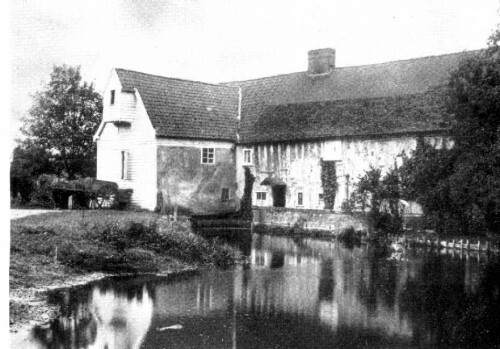 purchased the Manor of Campsea, other lands within the parish and lived at Ash Moorhall, the manor house, around 1558. John Brame Esq. purchased the Manor of Ashe and Chantry Hall, (the manor house) from Theophillus Howard in the early 1600s. There is evidence that John, who married Rose Armiger of Campsea Ashe, was living in the village from 1590, when their son John was baptised at the church. This John, who inherited from his father, purchased the Manor of Valence, Blaxhall. When his son, also John, graduated as a barrister-in-law, his father conveyed ownership of this manor to him. After several generations, the Ashe Manor House Chantry Hall and its state were purchased by John Revett, a relative of the Brame family through marriage. The Sheppard family lived at Ash High House from 1652 to 1882. John Sheppard purchased the High House and its estate from William Glover in 1652 and made it his home. John was born in Mendlesham, (the family seat), in 1607. He was the eldest son and heir of John and Elizabeth, nee Lane. (She was daughter of John Lane of Campsea Ashe). John inherited large estates, lands and properties on the death of his father in 1628. In 1865, part of the house was burnt down. It was rebuilt in the old style, the architect being Anthony Salvin. In all, nine generations of the Sheppard family lived at Ashe High House until John George Sheppard died without issue in 1882. The High House and its estate were sold to the Honourable William Lowther the same year. A newspaper report on the sale stated that the estate contained 4,100 acres, the deer and home parks,144 acres and woods and plantations about 240 acres. The rest of the estate was divided into 13 farms and several houses and cottages. In the magazine, Country Homes and Gardens, 1905, it said that the deer park was one of the oldest in Suffolk. Reference was also made to two impressive parallel canals flanked by ancient yew hedges. William Lowther purchased Ash High House in 1882/3 and his family became residents of Campsea Ashe for the next 66 years. He was born in 1821, son of Colonel Henry Cecil Lowther. He returned to England after a number of years in the diplomatic service and lived in Mayfair, London and in 1868, was elected MP for Westmorland. Ashe High House was William’s country seat. He died in 1912 and was succeeded by his son, James. James Lowther was born in 1855 and married Mary Frances, daughter of Alexander Beresford-Hope. James was MP for Rutland and was Speaker of the House from 1905 until 1921. On his retirement he was created Viscount Ullswater of Campsea Ashe. In died at the High House in March 1949, aged 94 years. Ashe High House and its estate were sold in 1949. The sale catalogue described the mansion as an Elizabethan style residence standing in 16 acres, with 31 bedrooms and dressing rooms, 6 bathrooms, 6 reception rooms and a library. There was also a squash court with building, lawns with cedar trees, water garden, kitchen garden, orchard and vinery. The estate comprised of 13 farms, 25 other houses and cottages, 106 acres of timber, amounting in all to 2717 acres. Ashe High House with its grounds was sold to The Desborough Settlement Trust but in 1953 it was sold to a developer. The house fell into ruins after the lead was taken off the roof and when Lt. Colonel Richard Schreiber bought the house and its immediate grounds, he had to demolish it. Only the foundations of this magnificent house remain today. The Parish Church is dedicated to St John the Baptist. Although Norman stonework has been found in the footings, the church was probably completed at the beginning of the 1300’s. A rector was appointed, when the first known advowson was presented by Alice, Countess of Norfolk, widow of Roger Bigot, in 1312. In the 14th century, the tower was added which is 76 feet (23m) high. The church was altered and restored between 1789 and 1792 under the stewardship of Rev Kilderbee, incumbent at that time. The second modification and refurbishment took place under Rev H. Knatchbull, incombent, in 1869/70. He was the son of Rt. Hon. Sir Edward Knatchbull. It is believed that bells had been rung from at least 1553 but in 20th century they deteriorated to the point that they could not be used. A partial restoration took place in 1999 so that they could be rung for the start of the new millennium. In 2010, full restoration and augmentation of 4 to 6 bells was completed. A new gallery was built to replace the one which was removed it 1878, which became the new ringing gallery. The Rectory borders on the west-side of the churchyard, which surrounds the church. It was first mentioned in the church terriers of 1751. In the 1753 terrier, it refers to “the parsonage”. It seems highly likely that there was a parsonage on this site before these dates. In 1826, the building was completely refurbished, which was carried out by a local man, Jonathan Beedon. In 1906, the Rectory had fallen into a bad state of repair and major renovation took place including replacing the thatched roof with red tiles. In 1942, it was used by the Woman’s Land Army as a hostel. The rectory was sold in 1947 to a private local person. Today the Old Rectory as it is known, is a well presented Georgian House with a wealth of original features despite all the renovation. In the parish archives, there is a reference to “one schoolroom in the village” in 1834. On 31st December 1861, the School Log Book records “opened school this morning it having been closed twelve months. Children very backward”. It was signed by the Headmaster, C. Hemsley. In 1888, the school, which could cater for 80 children, had an average attendance of 66. In 1896 /7 structural alterations were made including another classroom, a cloakroom and kitchen. In 1902, the school came under the County Council. It remained a Church of England School and continued to be the village school until 1973, when it finally closed. The school building is now a private home. On 26th February 1859, the first train travelled through the new station in the centre of village. It was however, named Wickham Market Station, (Wickham Market being 3 miles away) and many theories have been put forward as to why this was the case, but no definite answer has yet been found. The East Suffolk line ran from Ipswich to Lowestoft through Campsea Ashe. It was a double track with level crossing and signal box and goods yards and sheds. The Talbot Hotel was built opposite the station to cater for travellers. In 1902, the level crossing was replaced with a bridge over the track. The railway and station was very beneficial to the village. Local farmers could dispatch their corn, produce and animal stock more easily. A dairy or creamery was built near the station yard but no longer exists. Later in 1922, a cattle market was established. Although the “live”cattle market has recently closed, the auction rooms and market still function, opening every Monday. The railway line survived the “Beeching Axe” and the station house still remains but no longer operational. There is only a single line track today.